Did I forget anything?Comments, please. All comments answered. Total…………………………………………….. 31. ounces = 1.9 lbs. 1 Tarptent -Moment —– 32 oz. 1 down bag, Western Mountaineering/stuff sack, 20F 40.0 oz. 1 Ibex wool long sleeve zip T 5.8 oz. 1 socks wool 2.6 oz. 1 headlamp w/ batteries ( Princeton Byte) 2.1 oz. 1 stuff sack sil-nylon……………………… 1.3 oz. 1 Exped Down mat 31.0 oz. Total…………………………………………… 96.2 ounces = 6.0 lbs. 1 pr. wool socks 2.6 oz. 1 pr. Manzilla Windstopper gloves 2.2 0z. 1 Ibex wool hat 2.1 oz. 1 pr. Patagonia mid weight stretch tights 8.6 oz. 1 Pat. wool midweight long sleeve hoodie 9.4 oz. 1 Western Mountaineering Hooded Flash Down jacket 9 oz. 1 pr. New Balance Minimus shoes 10.7 oz. Total…………………………………………… 44.6 ounces= 2.8 lbs. 1 Steripen Adventurer 4.4 oz. W/ Titanium cook pot 700 ml modified w/ lid 10 oz. 1 water bottle – used Gatorade bottle… 1.7 oz. 1 qt. water bottle ( Tiki Mon) 5.4 0z. 1 Ursak Minor – food bag…………. 2.7 oz. abrasive scrub pad, Bronner’s soap 1.0 oz. 1 cup, bowl=Orikaso 4.2 oz. 1 MSR coffee filter 0.6 oz. 1 length cord – 50’…………………………….. 2.5 oz. Total…………………………………………. 36. ounces = 2.25 lbs. 1 small pack towel…………………………….. 1.3 oz. 1 bottle hand cleaner ………… 1.3 oz. 1 partial roll toilet paper…………………….. 2.0 oz. 1 Baby wipes 2.0 oz. 1 chap stick 0.2 oz. 1 disposable razor 0.1 oz. 1 small tube tooth paste……………………. 0.7 oz. 1 iPhone with headphones, wall charger and connector 6.6 oz. 1 Solio solar charger w/ wall charger 8.8 oz. Read this book in two days, it was that fascinating. Continue reading–>Goodreads | Tom Jamrog (Lincolnville, ME)’s review of The Power of Habit: Why We Do What We Do in Life and Business. I’m no barfly. I can count on one hand the times when I’ve walked into a bar, alone, and schmoozed along in there. Fact Check #1- Actual years have gone by between my extremely occasional bar visits. However, I went into Rockland tonight to hang with the “Bubba Council” at Rock Harbor. It was quite an honor to be invited into that inner sanctum. I walked in and there they were, with 7 hands extended to join mine, holding down the whole corner of the bar at the local pub. There was power in the room. Once a week. Now. The Bubbas are a notoriously informal group of mountain bikers who have managed to not only ride together for 18 years, but to do it in full blown ragged royalty, with a four-season regularity that has been immensely appealing to me since that fateful day almost twenty years ago when Smiling Dave suggested that I should head over to the Snow Bowl on Thursday night at 5:30 and ride with these guys. The deal we have here doesn’t go down very often, and I’m holding onto it for dear life. What I saw on that first ride with these guys floored me. I watched bikes fly. Actually lift up and fly. Fly over horrible, rock-strewn threads of a trail, paths that climbed at impossibly steep grades to twist around trees and then cascade over streams and fallen logs where a mistake meant bruises and often blood. For a couple of years, I actually believed that my rides at Ragged meant blood, mine, somewhere. I’m able to ride like them now, almost. So tonight, I hoisted a couple of beers and savored the deep flavor of community with my brethren riders. We have experienced each others’ bleeding, bruised, and broken forms, as we wince, laugh and grouse our way through the deep forests, bogs, and fields of Midcoast Maine. As Stevie said tonight, over fresh deep-fried potato chips and drafts, “Everyone is going to crash sooner or later.” Even Stevie took a big hit this fall, and he’s a pro in a Hawk suit. There are walking trails that we ride on like the George’s Highland Path, where I’ve never seen another person other than a Bubba, even though I’ve been riding these trails dozens of times. The enthusiasm of a riding a half to a dozen single-track miles together has us talking about where we’re riding the next time before we are even done with this one. It’s been a thrilling, and sometimes painful ride. Sometimes it’s at night, maybe on a Sunday morning, but- Joy also shows up for the ride. We talked tonight about why we do this. Why have we have been at it for 18 years, each spending many thousands of dollars on upgrading the bikes to allow us to ride longer, faster, and climb easier ? Why did we find 16 riders who pulled together this November in the Bog? It’s crazy? I’ve even spent more on my new 29” Santa Cruz that I had on my last car. Crazy! We do this because we care for each other, show interest in each other, pick up each other when we’ve crashed, make fun of each other, and appreciate the company of other men as we live in the woods for a couple to three hours, a few times each week, under rain, sun, darkness, snow, and whatever else this glorious world outside out windows promise us. Fact Check #2- I laugh a lot, smile when I’m not laughing, and always feel alive when I ride with the Bubbas. 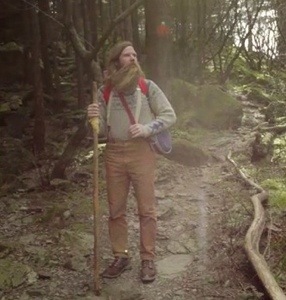 To thru-hike the Appalachian Trail, you don’t even need maps, or resupply boxes. There are 165,000 2” by 6” painted white blazes along the length of the Trail, with the vast majority of them within sight every moment you are on the trail. If I were walking again, I’d buy a set of 4 “Mapdanas” to assist in planning my way. 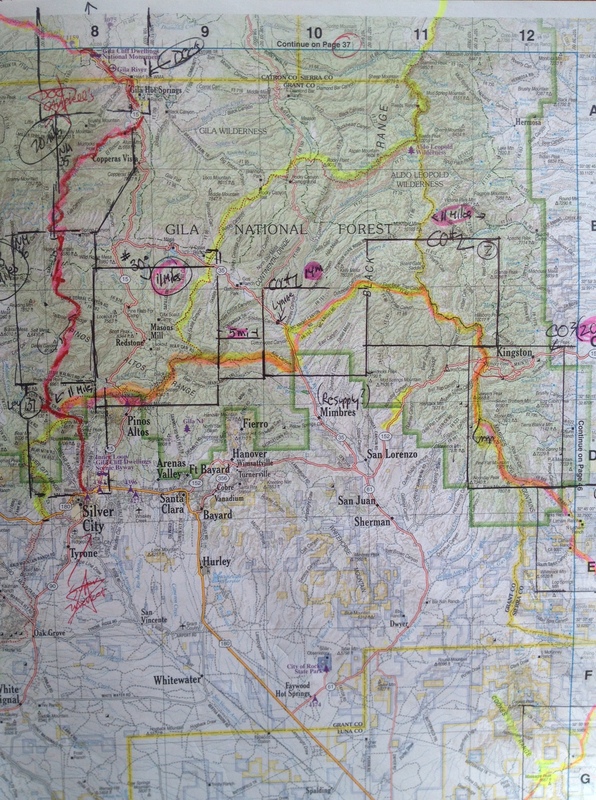 On the PCT, you’d better have maps. I walked for a few hundred miles in California’s High Sierra on snow pack that was so deep that the trail and any of the blazes were buried below. While I would have preferred a GPS on my thru-hike, I was able to sharpen my navigation skills, but I did often get off course, even in the company of capable others. 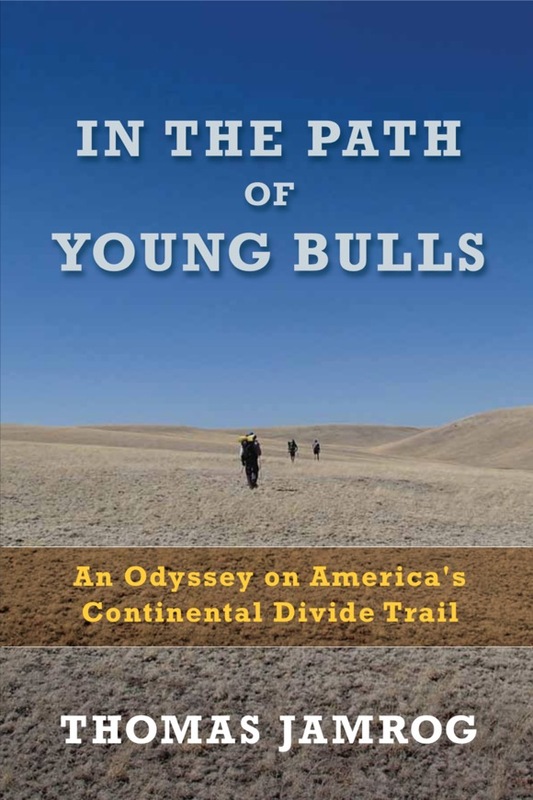 People have walked the length of the Continental Divide Trail without a GPS or detailed maps. It’s possible- you just keep heading north, making adjustments as you go. Better navigators than I have strongly recommended carrying, and knowing how to use, a GPS on this hike. I have read that there are trail sections that go as long as 200 miles without a CDT sign, and that the real issue is unmarked intersections that leave no clue as to where the actual trail goes. I bought a new GPS for this trip- a Garmin eTrex30. It’s small, light, and allows the use of removable SD cards. If I encounter other eTrex30’s out there, we can engage in wireless data transfers of waypoints, tracks, and routes. The unit also utilizes a barometric altimeter, which can pinpoint elevation readings. When I travel trail, my practice of keeping an estimate of miles hiked, along with elevation readings, really helps locate me on the map. In practice, my GPS will be turned off while hiking, and will be activated if and when the going gets questionable. Otherwise, I’l go broke replacing AA batteries. I will also be carrying a complete set of Jerry Brown’s CDTNST Map books, along with his 2013 upgrades. These maps reflect the 2013 “official route”. The CDT is 70% complete (with Montana less complete than that figure) allowing for as many as 5 alternate route sections along the way. There is always the possibility that an alternate route may be needed, due to the nature of the ever-present summer wild fires that close sections of the official trail, and storms and deep snows that might affect a choice in places like Northern New Mexico and Colorado. In 2011, the Gila River alternate was closed to a huge fire. Because of this, I’ll also be carrying alternate maps, most specifically Jonathan Ley’s map sets . I have just received word from Jonathan that his 2013 set is fully updated and that he will be sending me a compete set on a CD. I will download the sections I plan to use as back up, load them onto a zip drive, and take it to Staples where they will be printed on color double -sided 11 x 17” paper. For all of his work, Ley receives donations from his appreciative map users. That’s not all. I took advice from Yogi’s CDT Handbook and also purchased selected Bureau of Land Management and US Forest Service maps. How much does all these maps and GPS cost? Over $500. Yikes! -plane ticket to El Paso Purchased for April 16. -Found out that I’ll just miss the Sunset Unlimited Amtrack west (by an hour) from El Paso when I reach the airport. The next Amtrak west will be two days later. Plan B = the Greyhound bus to Deming, arriving early evening. -Reserved room at Deming motel ( 1 block from bus station). -The Columbus route starts south of Columbus. Arranged supports from Keith Schwarzer to drive us 55 miles south to get there. -Transferred the outlines of each of Ley’s Columbus route maps onto New Mexico Delorme’s pages for quick reference. -Purchased Bear Creek’s SD cards to go w/ GPS. ( Already purchased map set in 2012, and the upgrade book 2013). Contacted Jerry Brown about eTrex30 details. -sprayed Vegigators with rain repellant. -major order forwarded to sponsor Four Dog Stove– 50 Mountainhouse freeze dried dinners, assorted Mountainhouse lunches and breakfasts, additional map order (BLM and Delorme Wyoming), 2 cases of Coghlan solid fuel tabs ( hexamine). Less than two minutes long, but definitely hooked me up to the world I love and hope to be experiencing on April 17. I’ve recently spoken to two of my friends who have bemoaned the fact that they can’t exercise every day like they used to, and that they feel the need for a rest day in between sessions. I agree. Here’s encouraging news that suggests we might be doing the right thing in backing off. Getting the Right Dose of Exercise – NYTimes.com. I have superb black shell Mountain Hardware Ventigators (gaiters) that I have become most fond of, but that are now a disappointment. I have used the gaiters, off and on, since I purchased them Virginia when thru hiking the Appalachian Trail in 2007. Maybe I should not be complaining? I have no problem with the gaiters. I especially like them because they have a zip away meshed ventilating quarter panel that is excellent for dumping heat in the warm weather. They have held up very well, no tears, no fraying. As instructed, I sent them in after I receiving email instructions and an RA number. The call I received back after a week or so was disappointing, right from the start. First, I the representative said that the product code informed him that I had the gaiters since 2002. I corrected him with the 2007 date. It didn’t make any difference. 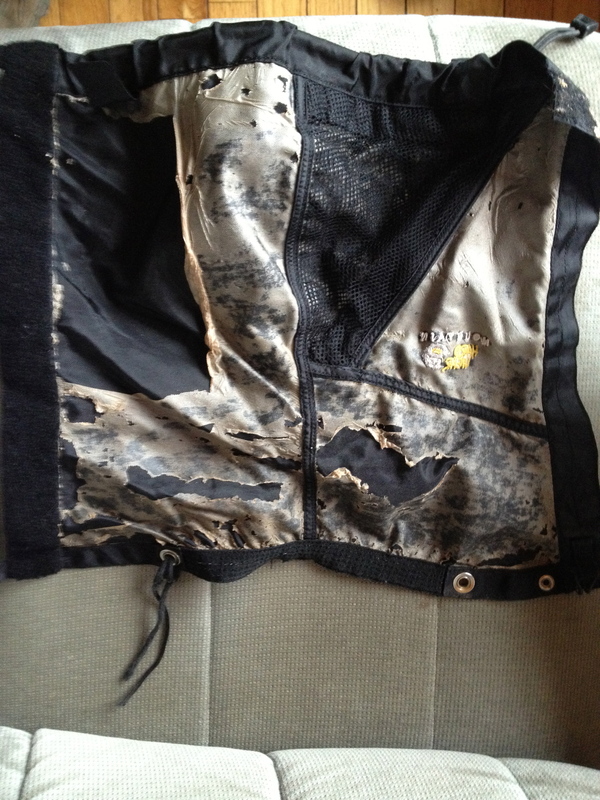 The fellow held firm that my problem was wear and tear -no defect. But I could tell he was proud to come back at me with a Pro Deal. Go on the website, select a new gaiter, and purchase it for half price. Sounded good to me. 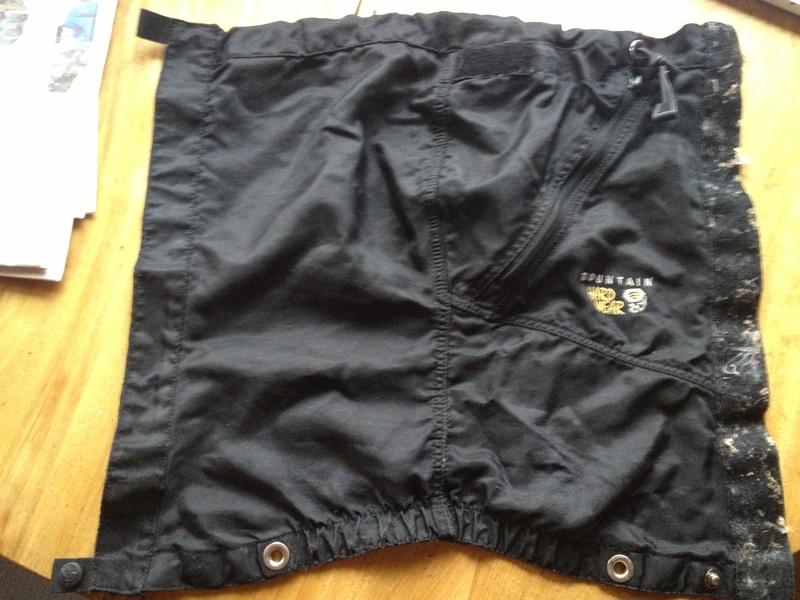 Unfortunately, Mountain Hardware discontinued the Ventigaiter. They have are 6 models, three beefier unvented, solid mountaineering gaiters that are overkill, and some shorter ones that don’t cut it with me. 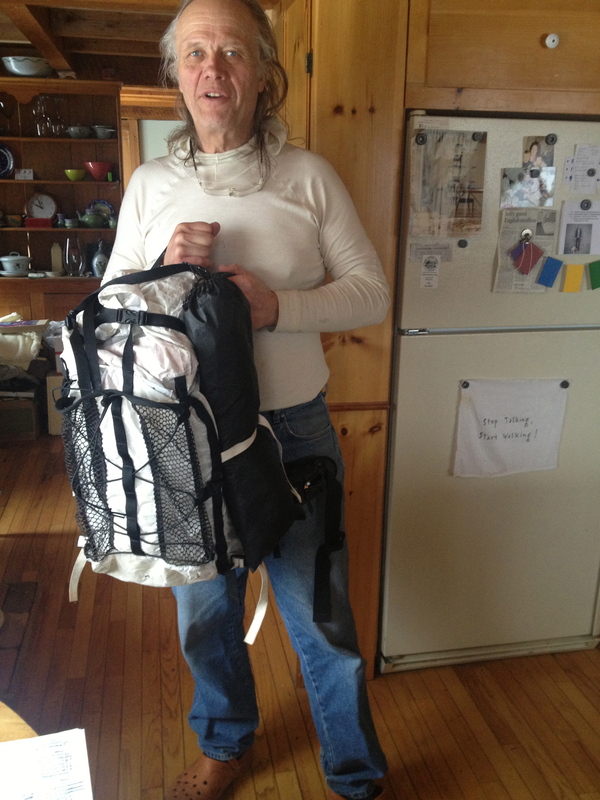 We discussed me keeping my gaiters and recoating them with a couple of products that he recommended. I also spray them with permethrin, a month long tic repellent treatment. I like the fabric to come up just below my knee. When I walk through grasses and brush, I get far fewer tics than do my hiking partners. I believe that I’ve escaped Lyme disease by wearing my treated tall gaiters. I wanted to choose a pair for half price, with the Pro Deal. I changed my mind when i was told that I could not both get Pro Deal gaiters and also have my old ones sent back to me. PIck one or the other. I’m spoiled by impeccable customer service. Patagonia honored their warranty of my Super Pluma rain jacket due to delamination in the forearms after 4 years. I’m done with these Mountain Hardware guys. Lest the reader thinks I am a malcontent, who relishes the habit of trashing companies for poor customer services, I have experienced nothing but superb satisfaction from the following companies that have dealt with me and my gear problems, and want to give a LOUD shout out to: Leki, Tarptent, Patagonia, Steripen, ULA Equipment, Darn Tough (socks), Princeton (headlamps), Cascade Designs (Thermrest), and Ibex (wool) clothing. I am headed into an unplanned surgery this coming Friday to repair a hernia. Bummer. I will be on a much reduced program of healing for as long as 6 weeks. 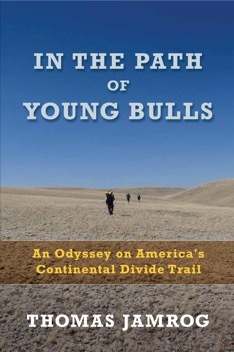 I have a plane ticket already purchased for a flight from Maine to El Paso on April 16, when I cobble together rides to reach the Mexico border at Chihuahua , then turn around and start a 3,000 backpacking walk to Canada, over the Continental Divide Trail. How did I get into this situation? I even had a physical at the beginning of December when I asked to be checked for a hernia on my left side. My physician did the deed, I coughed, and she told me that I did not have a hernia. I’m sort of an expert in this questionable skills area, as I have already experienced three hernias on my right side. I told her that I had been feeling fatigue in my lower abdomen for some time- not pain, but an awareness that that part of my body begins to ache when I hike all day. Thankfully, she was not defensive, and suggested that I contact a surgeon to get a second opinion. Enter Dr. Paine. He was booked solid for many weeks, so I requested to be put on the wait list for a call. This past week, I was home working at my desk when that call came in at 10:20 AM for an 11:00 opening. It took Dr. Paine all of 1 second to tell me I had a hernia. When I explained about my hiking plans, he assisted the secretaries in bumping people around to fit me in for the surgery this week. Good man. I have several physical concerns that are a part of my life. Granted, I’m healthy, with no known diseases that require prescription medication. I do have a chronic Vitamin D deficiency that has not improved after three years of various D3 treatments, including 50,000 unit capsules. Other than that, I’m the picture of vigor. However, not all is rosy. I’m wearing out! 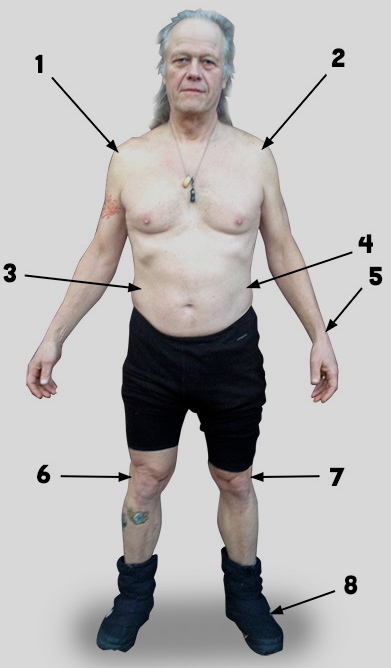 2-Surgery to remove arthritis and repair suspected torn rotator cuff ( 2006)- cuff was fine, “You have the shoulder of a man in his 80’s” Complete shoulder replacement predicted to be necessary between 2011- 2014. 3-Three right side hernias ( same location)- 1966, 1972, 1982. OK now. 4-Hernia repair scheduled for 2/15/13 ( Friday!). 5-Bone on bone situation in wrist, w/ chronic pain in 2001. Surgery recommended to cut and remove section of my forearm bone, and install metal plate with screws holding it in to alter wrist function, trim arthritis from wrist. Declined. 6-Right knee- traditional surgery to remove torn meniscus- 2 large open incisions. No further issues. 1980’s? 8- Chronic inflammation of 2nd metatarsal in foot-> nerve damage- surgery suggested going in through the top of the foot- Declined. Orthotics prescribed and used. The damage was due to a biomechanical gait problem which I have worked to correct after two years. So I plan to ask my doctor to give me highly specific directions of how far I can walk, when I can increase mileage, and what I can lift in the 6 weeks it will take me to heal. I have agreed to have my wife, Marcia, come in with me and hear what he tells me. I have NO interest in blowing this recovery. Even if I require the full 6 weeks to heal, I will have three weeks to fully train for the hike. In the past I have healed much sooner than expected, but I’m older now. Dr. Paine told me that I should be able to start backpacking in mid- April, and I plan to be a good patient and be in flight on April 16, and in decent shape. I’ve looked at the elevation profiles for the first week and it’s fairly flat, which should help. Core workout before big blizzard pays off ! Single digit temperatures, a bare porch, and a blizzard on the way? Better get active. I moved a half cord of firewood yesterday afternoon before the next “possible snow storm of the century” hit coastal Maine. Big hype? My tractor’s trailer failed me after the trailer’s tire slipped off the rim as I was driving a full load of wood up the hill to my enclosed porch. I had a couple of hours before dark, so I went to plan B, which was push, lift, turn, and restack with the help of the trusty wheelbarrow. I managed to move 18 barrow loads of dry hardwood until there was no more wood to reclaim before it would have been buried under lots of white crystalline water. Was it worth it? YUP! #1- We may lose power here, with the possibility of very strong winds during the storm. 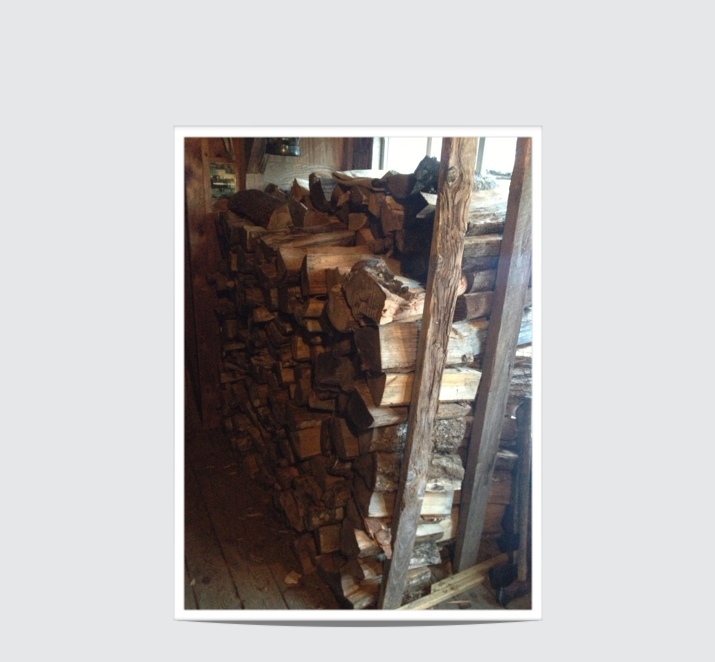 The heat from our wood stoves are not dependent on electricity. There is also NO COMPARISON to the comfort of a stoked and glowing a wood stove to the meager blasts from the duct work of a hot air furnace. #2- I did a quick bit of research this morning. Our furnace is fueled by propane. One half cord of dry hardwood is the equivalent of 80 gallons of propane. Since my last charge for a gallon was $3.00, that half cord on my porch is worth $240. Much of that load was free, as I harvested the trees here on on our property. But even if I paid the current cost of $200 a cord for split and delivered hardwood, which I do some years, I still would have saved $140.